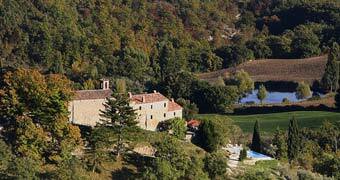 Not far from Perugia, at the end of the Val Tiberina and the confluence of the Reggia and Tiber rivers, lies Umbertide. 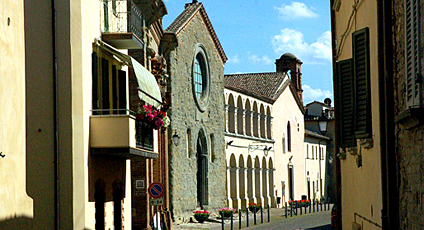 The town, founded some time around the 10th century, was originally known as Fratta. Its was renamed Umbertide in 1863, in honour of the then Crown Prince Umberto. The two most important works of architecture in the town's historic center are the Rocca, or citadel, and the Church of Santa Maria della Reggia. The first is a 14th century construction characterised by an imposing 40 meter high square tower and three shorter crenulated turrets. 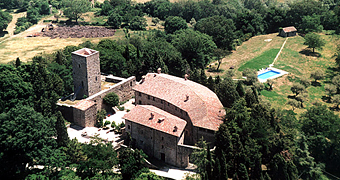 Today the Rocca is open to the general public and is home to a center for Contemporary Art where numerous exhibitions are held. An octagonal shaped building topped by an attractive dome, the Church of Santa Maria della Reggia dates back to the 16th century. Another church more than worthy of visit is that of Santa Croce, in which a museum containing Signorelli's Deposition of Christ is housed. A fresco attributed to Pinturicchio can be admired in the Church of Santa Maria della Libertà. Just a few kilometers from Umbertide, lies the Castle of Civitella Ranieri, a beautifully preserved 14th century fortress complete with two square and two cylindrical towers.